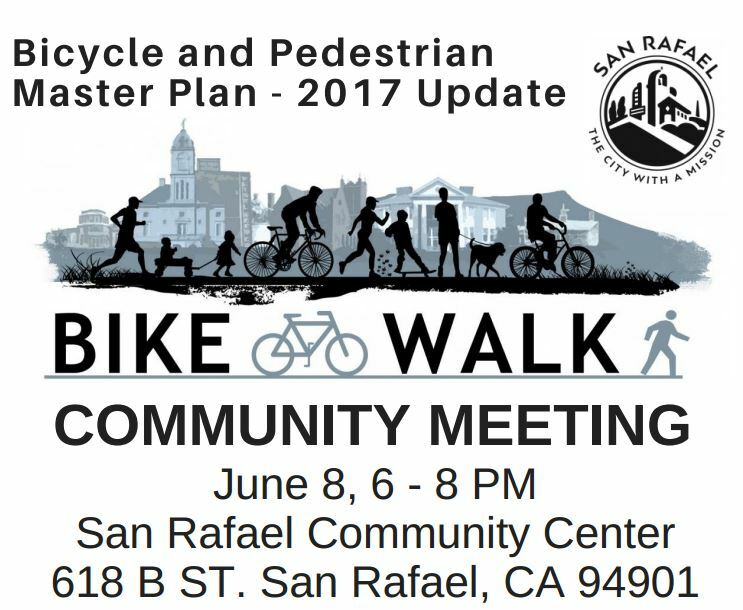 The San Rafael Bicycle and Pedestrian Advisory Committee invites you to come and participate in a Public Workshop on June 8th at 6:00 p.m. as part of the process to revise and update our Bicycle and Pedestrian Master Plan. This update will focus on improving safety, connectivity, and development of infrastructure suitable for all users from kids to seniors. This is a great opportunity to come and tell us what does and does not work for you, your family, your friends, and your business when walking and bicycling in San Rafael. Located next door to Albert Park and overlapping with the Downtown Farmer’s Market, this is a family friendly event. We hope to see you at the San Rafael Community Center for this community meeting.